Patrons who frequent Holland Village and Chip Bee Gardens along Jalan Merah Saga would certainly be familiar with Michelangelo’s restaurant and his sister outlet Original Sin – the latter in 1997, became Singapore’s first vegetarian Mediterranean restaurant. Unlike the typical boring bland and green usually associated with vegetarian food, Original Sin’s dishes came packed with vibrant colours and full of flavours. 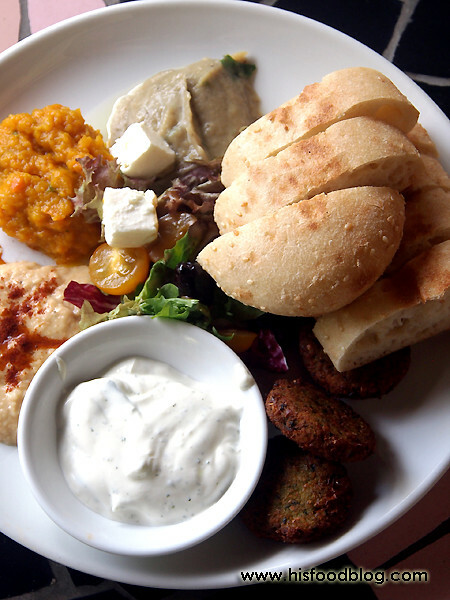 This was evident in the Mezze Platter ($22.00 for starter, $30.00 for main), a Middle Eastern platter with a selection of dips consisting of Hummus Chick Pea Dip, Aromatic Pumpkin and Carrot, Eggplant Baba Ganoush and Yoghurt Tzatziki, served with Falafal Ball and Pita Bread. HFB was fascinated with the eggplant baba ganoush that was surprisingly flavoursome, but he was most impressed with the freshly baked pita bread that was baked in-house and served warm, soft and fluffy – so good that one could eat it on its own. 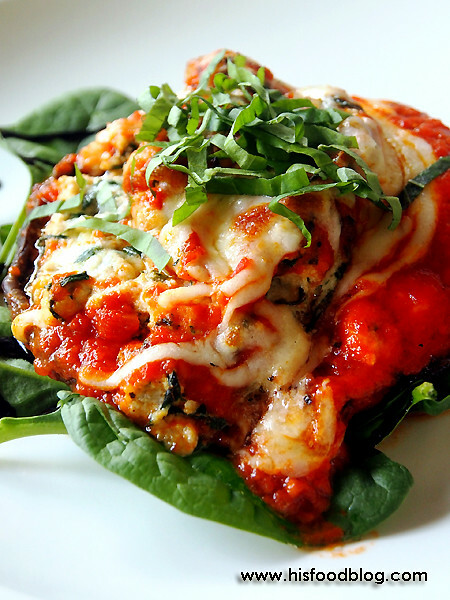 Although Original Sin’s version of Magic Mushroom ($18.00), a baked Portobello Mushroom with Ricotta Cheese, Spinach and Pesto topped with Tomato Basil Sauce and Mozzarella, did not come with hallucinogenic effects when eaten, it’s moist and juicy texture served with a balanced sauce that was not too tangy was truly first class and definitely intoxicating. 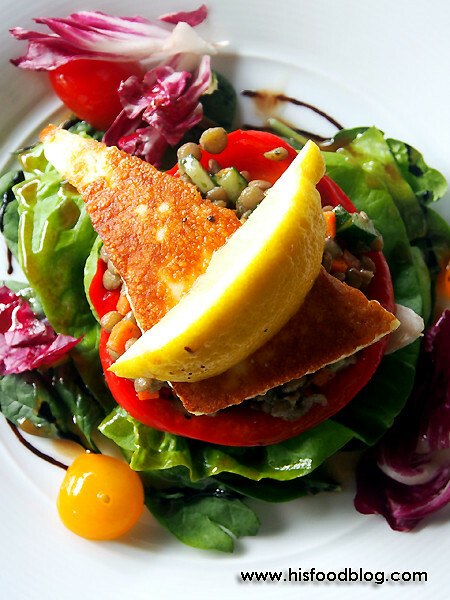 Haloumi ($18.00), a pan fried Haloumi Cheese served with Salad Greens, Roasted Capsicum and a Lentil, Cucumber and Mint Salad, was simply delightful. The texture and the flavour of the cheese were really enjoyable that made this dish a must-have for one’s starter dish. Fantastic! 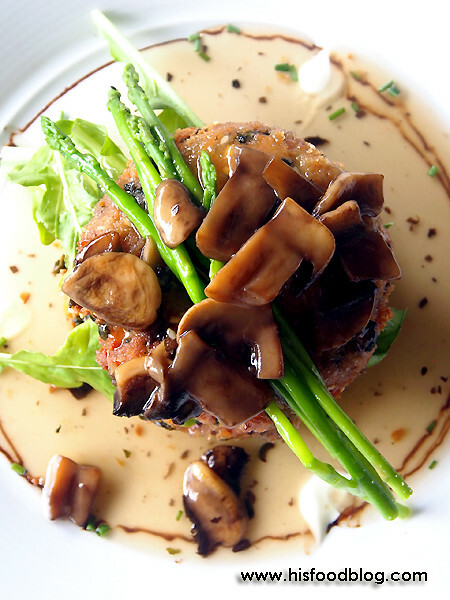 Bosco Misto ($26.00) a dish made of Spinach, Feta and Tofu Patties coated with Crushed Almonds and Sesame Seeds, Asparagus, served with a Button Mushroom Plum Sauce was one of Original Sin’s signature dish. Although HFB is not a huge fan of tofu patties, Original Sin’s version was a refreshing one – the exterior crust was enjoyable and the interior a hint of nice creamy finishing. The sauce was also surprisingly more savoury than sweet, which was a good thing. 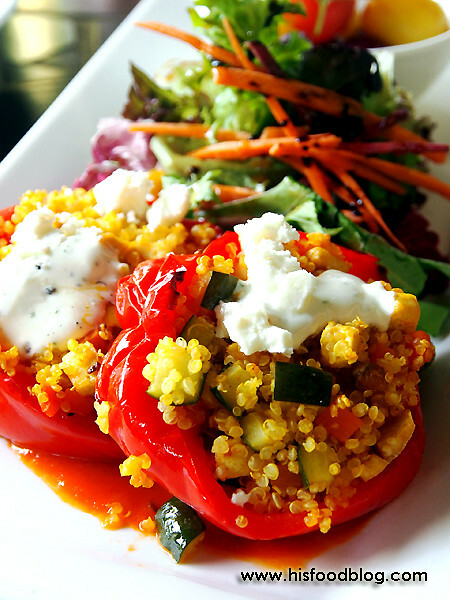 A staple of Mediterranean cuisine, Original Sin’s version of Capsicum Quinoa ($26.00) came with Roasted Capsicum stuffed with Spiced Quinoa, Carrot, Chickpea and Mint with Tzatiki, with a side of Pickled Grape, Onion, Cherry Tomato, and Olive Salad. The Quinoa was perfectly prepared in a fluffy, almost al-dente-like texture and nicely flavoured with spices. The caramelisation of the roasted capsicum also provided an added sweetness to this dish. 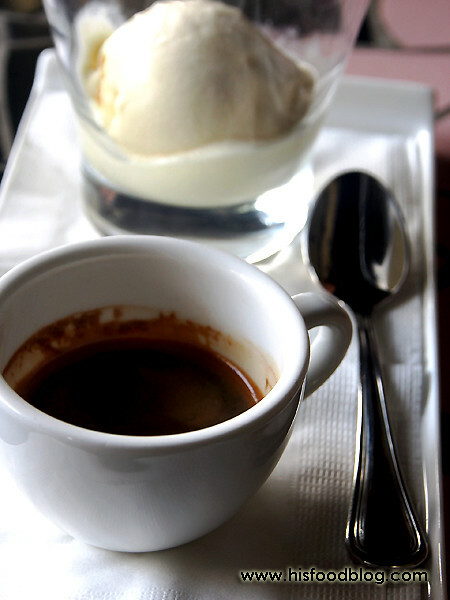 Nothing beats a nice cup of Affogato ($8.00), or Espresso with Vanilla Ice-cream, after lunch. Rich and refreshing…… a suiting finish. Disclaimer: No ratings would be given, as this is an invited media tasting. HFB would also like to take this opportunity to thank Original Sin for their hospitality. I don't often get turned by vegetarian food, but this looked a treat. Nice photos HFB. Hard to believe that its vegetarian food! Each dish looks so amazingly beautiful and appetising!! @steve: Thks, good to hear from you mate. @foodiefc: Indeed. I am sure you will love it too. Great fan of Original Sin! I have to say, the vegetarian food there aren't like any other (no processed mock meat at all). It's a real treat for vegetarians and meat eaters might just agree!